Agroforestry systems are believed to provide a number of ecosystem services; however, until recently evidence in the agroforestry literature supporting these perceived benefits has been lacking. 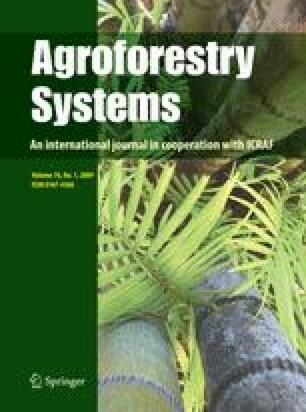 This special issue brings together a series of papers from around the globe to address recent findings on the ecosystem services and environmental benefits provided by agroforestry. As prelude to the special issue, this paper examines four major ecosystem services and environmental benefits of agroforestry: (1) carbon sequestration, (2) biodiversity conservation, (3) soil enrichment and (4) air and water quality. Past and present evidence clearly indicates that agroforestry, as part of a multifunctional working landscape, can be a viable land-use option that, in addition to alleviating poverty, offers a number of ecosystem services and environmental benefits. This realization should help promote agroforestry and its role as an integral part of a multifunctional working landscape the world over. I would like to express my sincere thanks to Drs. Michael Jenkins and Michael Banister for their comments and suggestions on an earlier version of the manuscript. Financial support provided by the J. William Fulbright Foreign Scholarship Board and the Bureau of Educational and Cultural Affairs, United States Department of State through a Fulbright Scholar Grant during the preparation of this manuscript is also gratefully acknowledged.